Offering you a complete choice of products which include tube magnet. We are the leading manufacturer, supplier, and exporter of Tube Magnet. Our range of EMF Permanent Magnetic Grate/Grids/grill is specially designed primarily as well as secondarily to fit in the hoppers for extracting ferrous metals from the product into processing. As per customer requirements these can be designed and manufactured to all sizes or shapes. These are placed in the hopper for resting against the sides. This allows the material to flow through the grid. These grids are encased completely in SS 304 for rigorous handling and are generally used in hoppers in the plastics industry. To achieve a more elevated protection level, double & triple banked grates can also be developed. All grates are obtainable from us with either ferrite or powerful rare earth magnets that are suggested for fine ferrous particles such as rust and many others. 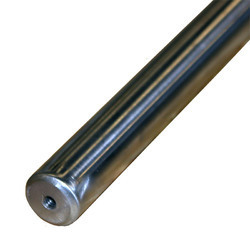 We can also offer single magnetic tubes with ends drilled and tapped to the customer’s requirements. Looking for Tube Magnet ?